VIDEO: Wanna Be Part of Project Involve? Fellows Tell You Why You Should Apply. Sometimes it’s hard to see, but things in Hollywood are getting better. As the entertainment industry continues to evolve and propagate, so too expands the number of opportunities available to young filmmakers (TV, features, online, streaming—you name it). And! With so much creative product being made, there’s suddenly a desperate need in Hollywood for new perspectives and experiences. In other words, there’s a desperate need for diversity. Enter Project Involve. As Film Independent’s signature diversity initiative, Project Involve has, for nearly 25 years, served to help build and sustain the careers of filmmakers—specifically, those from traditionally marginalized or underrepresented backgrounds. Each year, 30 (or so) Fellows are selected, collaborating together to produce short films, participate in master filmmaking workshops, engage in one-on-one mentoring sessions and network with top entertainment industry professionals. Sounds fun, right? So! If you think you would be a good fit for the Project Involve Class of 2018, we encourage you to apply today. The non-Member deadline is June 12. The extended deadline for Film Independent Members is June 28. And if you’re not a Member of Film Independent yet, you can become one by clicking here. And besides all of the great, inspirational, career-building stuff we’ve already mentioned, Project Involve Fellows are entitled to more tangible benefits, including passes to the Film Independent Forum, Directors Close-Up, LA Film Festival and inclusion in the Film Independent Talent Guide. P.I. gave out almost $500K in cash grants and production services to current PI filmmakers in 2017, including $316K in in-kind for the shorts, $90K in Fellowships and $95K in production budgets (cash!). In other words, the shorts produced as part of the project have real budgets. Plus! As a P.I. Fellow, you’ll have the opportunity to be mentored by some of most accomplished and innovative names in the film industry. Past Project Involve mentors have included Ava DuVernay (Selma), Catherine Hardwicke (Twilight), Barry Jenkins (Moonlight), Spike Jonze (Adaptation, Being John Malkovich), Charles D. King (Fences, Mudbound), Christopher Nolan (The Dark Knight, Memento), Alexander Payne (Sideways, The Descendants), Christine Vachon (Carol, Boys Don’t Cry), Forest Whitaker (Arrival, The Last King of Scotland) and Bradford Young, ASC (A Most Violent Year, Selma). The Amazon Studios Film Fellowship provides a $10,000 grant to a visionary filmmaker in Project Involve. The Focus Features Lili Elbe Fellowship provides a $10,000 grant to a transgender filmmaker in Project Involve. 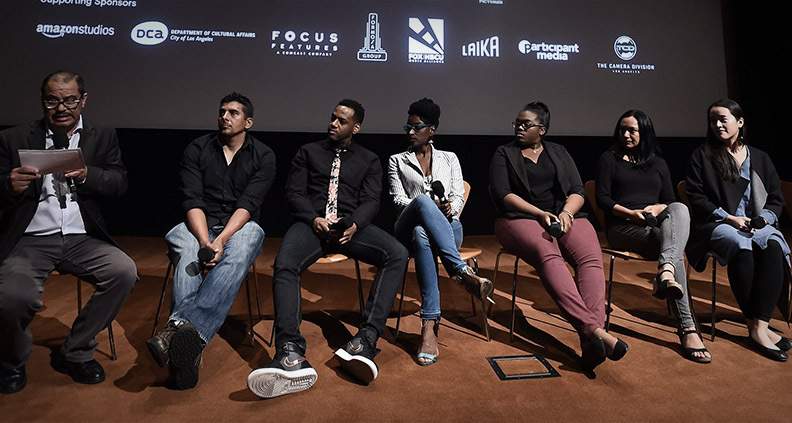 The Fox Film Fellowship awards a $10,000 grant to a FOX | HBCU Media Alliance (FHMA) member in Project Involve. The LAIKA Animation Fellowship provides a $10,000 grant to an animator in Project Involve. Alumni of Loyola Marymount University who apply to Project Involve can ask to be considered for the LMU Project Involve Fellowship. The fellowship includes a $10,000 cash grant, as well as inclusion in Project Involve. To be eligible for this fellowship, applicants must be alumni of Loyola Marymount University. The Participant Media Fellowship endows an exceptional filmmaker in Project Involve with a $10,000 grant. The Sony Diversity Fellowship provides a $10,000 grant to an outstanding filmmaker in Project Involve. The Sony Pictures Executive Track Fellowship provides a one-year full-time paid rotation at Sony Pictures Entertainment to a Project Involve Fellow aspiring to be an Industry Executive. The Turner Fellowship provides a $10,000 grant to an outstanding filmmaker in Project Involve. Learn more about Project Involve, including how to apply for the 2018 program, by clicking here. To learn more about Film Independent’s many (very cool) Artist Development programs, click here.